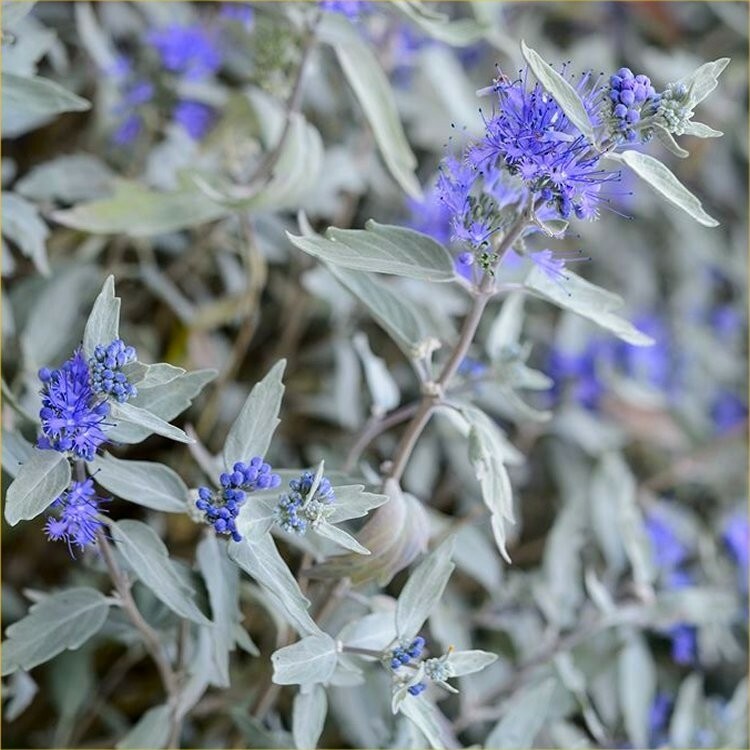 Caryopteris clandonensis 'Sterling Silver' is an particularly eye-catching deciduous shrub that bears neat silvery blue-grey foliage and deep blue flowers in late summer and in to the Autumn. Ideal for growing as a focal point in a patio container, or towards the front of a sunny border, it also works well planted in drifts and large groups to cover larger areas, reaching around 50-60cms tall. Ideal in well drain soils in a bright sunny position, sterling silver will combine well with a wide range of other plants, and will do best if given a hard prune in early spring or straight after flowering. Very easy to grow. Supplied in approx 2-3 litre containers.